Professor Koichi Furukawa received his M.D. in 1975 and his Ph.D. in 1984 from the Nagoya University School of Medicine. He underwent initial training to become an internist at Nagoya Eastern Citizen Hospital and Nagoya National Hospital. In 1980, Dr. Furukawa was employed in clinical hematology in the 1st Department of Internal Medicine of Nagoya University, under the supervision of Associate Professor Kazumasa Yamada. His experience abroad includes five years as a research associate at Memorial Sloan-Kettering Cancer Center in the laboratory of Dr. Kenneth O. Lloyd between 1984 and 1988. Dr. Furukawa was then appointed assistant professor in the Department of Oncology, Nagasaki University School of Medicine, in the laboratory of Professor Hiroshi Shiku in 1988 and later promoted to associate professor. He became a professor in the Department of Biochemistry II, Nagoya University School of Medicine in 1997. Dr. Furukawa is on the editorial board of Glycobiology. Polymorphic carbohydrate structures are believed to contain profound biological implications in cell-cell or cell-extracellular matrix interactions, since carbohydrate structures on proteins and lipids vary according to development, tissue differentiation, cell activation and senescence. The sugar moiety can be experimentally modified using a variety of approaches such as inhibitors for particular steps of glycosylation or carbohydrate processing. Despite the amount of accumulated information on carbohydrate functions based on these approaches,1 sufficient clarification of the biological roles of individual glycoforms has not been achieved. This is because the elimination of carbohydrates with some inhibitors involves difficulties in specificity and completeness. Moreover, these approaches are not efficient to analyze the roles of carbohydrates in multicellular systems in vivo. In the last decade, a number of glycosyltransferase genes have been cloned, and manipulation of glycosyltransferase genes and carbohydrate modification enzyme genes has enabled us to modify the glycoforms of cultured cells to fit any pattern, and to demonstrate the effects of the alterations in the carbohydrate profiles on cellular phenotypes. To generate controlled perturbations of glycosyltransferases in vivo, the most informative approach is via transgenesis, i.e., generation of transgenic mice or knock-out mice lines of glycosyltransferase and modification enzyme genes.2 Homologous recombination techniques and the availability of cultured pluripotent embryonic stem (ES) cells have enabled the production of defined null mutations. Recent progress in the production of gene knock-out mice for glycosyltransferases and sulfotransferases has elucidated a variety of novel functions of carbohydrates and provided new insights into their roles in vivo (Table 1). However, gene knock-out for glycosyltransferases also harbours various problems and limitations to correctly and fully understand the roles of individual carbohydrate structures in the body of multicellular organisms. Here, I have summarized recent advances in the understanding of the roles of complex carbohydrates provided from studies of gene knock-out mice of glycosyltransferases and modification enzymes, and tried to draw lessons for the future of glycobiology research. Galactosylceramide synthase is essential in the synthesis of galactosylceramide and its sulfated derivative, sulfatide (Fig. 1), both of which are enriched in myelin. Null mutant mice lacking this gene can still form myelin, but these mice exhibit severe neurological changes in the spinal cord with age, suggesting that galactosylceramide and/or sulfatide play important roles in myelin function and stability.3 These mutant mice had no late pachytene spermatocytes and spermatids, indicating that this enzyme is required for spermatocyte passage into the first meiotic division. Sulfatide synthase forms sulfatide, seminolipid and sulfo-lactosylceramide (Fig. 1). Knock-out mice lacking sulfatide synthase exhibit similar neurological abnormalities and disrupted spermatogenesis compared with galactosylceramide synthase gene knock-out mice.4 This fact indicates that the sulfation step is eventually important in both the nervous system and the reproduction system. GM2/GD2 synthase is a key enzyme in the synthesis of complex gangliosides (Fig. 1). Null mutant mice deficient in this enzyme lack all complex gangliosides, but are born and develop apparently normally.5 They are, however, sterile and show aspermatogenesis.6 The serum levels of testosterone in these mice are very low, although testosterone accumulates in interstitial Leydig cells, indicating that complex gangliosides are essential for the transport of testosterone (Fig. 2). In the knock-out mice, proliferation of spleen T cells was reduced upon IL-2 stimulation.7 Activation levels of JAK1, JAK3 and SAT5 after IL-2 treatment are reduced in the mutant cells, suggesting that complex gangliosides are required for the proper function of the IL-2 receptor. GM2/GD2 synthase gene null mutant mice show apparently normal brain morphology. However, the neuronal conduction velocity from the tibial nerve to the somatosensory cortex is significantly reduced.5 With age, the knock-out mice show marked degeneration and demyelination of the sciatic nerves and spinal cords, and poor regeneration of resected hypoglossal nerves, verifying that gangliosides are important in the maintenance and repair of nerve tissues.8,9 Glucosylceramide synthase (GST) forms glucosylceramide, which serves as the precursor of the majority of glycolipids (Fig. 1). Until E6.5, glucosylceramide synthase null mutant embryos were indistinguishable from wild-type embryos. However, at E9.5, all null embryos die.10 At this stage, they undergo gastrulation and contain the three germ layers: mesoderm, endoderm and ectoderm. Greatly enhanced apoptosis centered in the ectoderm in E7.5 embryos appears to be the primary cause of embryonic death. These findings demonstrate that the presence of glycosphingolipids are essential for embryonic development, and both sulfatides and complex gangliosides are involved in the regulation of the nervous system, male genital organ, and other systemic regulatory systems. Fig. 1　Synthetic pathway of glycosphingolipids and sulfatides. SA, sialic acid; Gb3, globotriaosylceramide. Ganglioside nomenclature is based on that of Svennerholm.39 Genetically disrupted enzymes are indicated with double lines. Fig. 2　Complex gangliosides are essential for the testosterone transport. 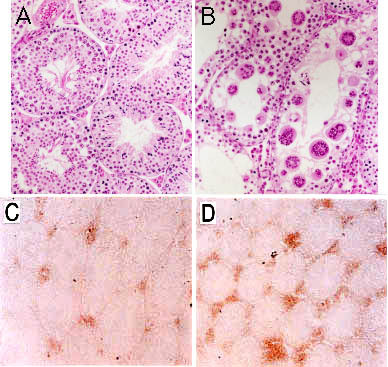 A, testis of wild type, and B, that of the mutant mice showing aspermatogenesis and numerous multinuclear giant cells. C and D are the staining pattern of testosterone in Leydig cells of wild type (C) and the mutant (D). Complex gangliosides-lacking mice showed markedly reduced serum levels of testosterone, while accumulation of testosterone was observed in Leydig cells in the mutant mice. E, a schema showing reduced transfer of testosterone from Leydig cells into seminiferous tubules and blood vessels. T, testosterone. Asparagine-linked oligosaccharides (N-glycans) in glycoproteins are classified into high-mannose type, complex type, and hybrid type. The core structure of complex type and hybrid type glycans is formed by the processing of high-mannose type glycans. Fig. 3　Biosynthetic pathway of N-linked oligosaccharides (A) and action of α-mannosidase IIx (B). Among knocked-out genes in N-glycan synthesis, those involved in the main synthetic or processing pathway bring about systemic and serious outcomes when disrupted. On the other hand, the disruption of genes involved in the synthesis of peripheral structures showed tissue-specific and relatively mild phenotypes. Various structures belonging to O-glycans are known, but a few synthetic steps have been analyzed with the knock-out approach. Thus, O-glycan deficiency generally resulted in dysfunctions in immunoregulatory systems, while analyses of other tissues and organs remain to be performed. Proteoglycans are polyanionic molecules consisting of different core proteins and different types, numbers, and length of glycosaminoglycans (GAGs). A number of enzymes are involved in the synthesis of GAGs in proteoglycans, i.e., enzymes for the synthesis of the common linkage region between GAGs and core proteins, for the initiation and extension of individual GAG repeating units, for the modification of GAGs such as N-deacetylation, N-sulfation, 6-O, 4-O, 2-O, 3-O sulfation and epimerization. Heparan sulfate 2-O-sulfotransferase transfers sulfate to the 2 position of the iduronic acid residue of heparan sulfate. When the 2-sulfotransferase gene is disrupted by insertion mutagenesis, the homozygous mutant mice die during the neonatal period,28 exhibiting bilateral renal agenesis and defects of the eye and skeleton. This finding is the first genetic evidence that differentially glycosylated proteglycans are involved in morphogenesis during vertebrate development. Hyaluronic acid synthases (HASs) form hyaluronic acids in vertebrates. The extracellar matrix component hyaluronan (HA) has been difficult to study because it is composed entirely of a free, linear, unbranched polymer of GlcNAcβ1,4GlcAβ1,3 disaccharide. Among three HASs, HAS 2 is essential for mouse embryonic development: HAS 2 null mutant embryos are lethal,29 whereas HAS 1 and HAS 3 mutants are not. N-deacetylase/N-sulfo-transferase (NDST) catalyzes the reaction of de-N-acetylation and N-sulfation, which are critical steps in the biosynthesis of heparin and heparan sulfate. Three NDSTs have been isolated, NDST-1, NDST-2 and NDST-3. The null mutant of NDST-1 shows postnatal lethality. NDST-2 null mutant mice were viable and fertile, and showed no obvious pathological phenotypes at 20 months. They have fewer connective-tissue type mast cells, and show loss of heparin in mast cells, but heparan sulfate levels in the liver remain unchanged.30,31 EXT1~3, which were defined in hereditary multiple exostoses as tumor suppressors, EXT1 and EXT2 were verified to be glycosyltransferases required for the biosynthesis of heparan sulfate.32,33 EXT1 homozygous mutants failed to gastrulate and generally lacked an organized mesoderm and extraembryonic tissues, resulting in a smaller embryo.34 Consequently, EXT1 is essential for both gastrulation and heparan sulfate biosynthesis in early embryonic development. The mutant mice of modification enzymes for GAG are generally defective in morphogenesis and organogenesis. Those of transferases involved in the synthesis of more basic structures of GAG showed lethality, suggesting the importance of GAG in fundamental processes during development. Gene knock-out strategy of glycosyltransferase and sugar-modifying enzyme genes is a very powerful approach and often gives rise to very clear results concerning the roles of carbohydrate structures in vivo. Actually, a number of unexpected results from analyses of gene knock-out mice have been reported as described above. Some of them could not be anticipated based on the knowledge obtained from current biochemical studies. They often provide quite novel information about in vivo functions of individual carbohydrate structures with fairly high solidity. The mutant mice of sulfatide synthase, Gal-Cer synthase, and complex ganglioside synthase commonly demonstrated essential roles in spermatogenesis, although the precise mechanisms may not be identical. This suggests that we should not harbour preconceptions about the major roles of individual genes, and also that the effects of some gene disruption on an organ or tissue may not necessarily correlate with expression levels of the gene. The expression level of the GM2/GD2 synthase gene and its products in testis are quite low compared with other tissues, while aspermatogenesis is the most serious feature in the gene-deficient mice. Although abnormal phenotypes sometimes appear when the null mutant mice are born, some abnormal changes may become clear after long observation or with age. Therefore, long-term observation with patience is needed to detect fine alteration in the mutant mice, as neural degeneration was found in complex ganglioside-lacking mutant mice. Various stresses to the mutant mice may be nesessary to make their potential defects overt as shown in the GnT-V-deficient mice. In the interpretation of the phenotypes of various mutant mice, many issues must be resolved and overcome. The precise analysis of the remaining carbohydrate structures which should be deleted in the tissues of knock-out mice is very important to adequately interpret the phenotypes of the mutant mice. Recently, it was recognized that multiple enzymes were more frequently involved in the formation of a glycosidic linkage than was previously expected. Therefore, careful immunohistochemical analysis using antibodies and lectins specific for lost structures are needed as well as chemical analysis. Simultaneously, we need to knock out multiple similar genes by generating double or triple knock-out mice to fully eliminate a carbohydrate structure and to fully clarify the roles of the products from individual genes. Except for a few examples, the molecular mechanisms for the resulting phenotypes from the performed gene disruptions are not yet well understood. Cells and tissues from gene knock-out mice should be valuable sources for the further analysis of the molecular mechanisms of carbohydrate functions in vitro. Beyond these efforts, the contribution of carbohydrates to entire regulatory mechanisms of cellular and tissue events may be elucidated. Drosophila melanogaster and Caenorhabditis elegans are useful organisms to investigate the in vivo function of glycoconjugates, because of the advanced techniques of gene disruption, availability of genome sequences and genetic mutants, and their short lifespan.36 Indeed, the critical roles of heparan sulfate proteoglycans during development have been demonstrated in the Drosophila system.37,38 However, many carbohydrate structures are not fully conserved between vertebrates and invertebrates. The gene knock-out approach in the mouse will continue to provide important information about in vivo functions of glycans in multicellular environments.